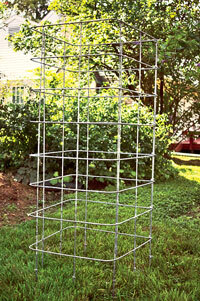 build a super sturdy tomato cage. we grow monsters. our tomato plants are 8 ft tall and we got bushels from 4 plants. we bought a house with land and plan to garden even larger this year. i can’t wait to get this built and have my mega tomatoes growing like gangbusters but totally OFF the ground! ← Starting Our Seeds Indoors…Getting Ready For Spring!